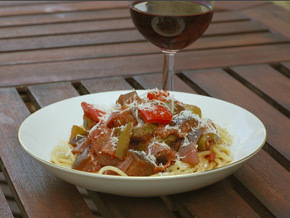 Ratatouille is a heathy Italian vegetable dish served with pasta. 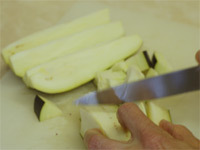 Chop the onions, egg plant (aubergine), zucchinis (courgettes) and peppers into ¾ inch square pieces. Fry the onion for a few minutes in a little olive oil. Add the rest of the vegetables and the crushed garlic and fry for a few more minutes. 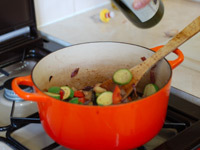 Add the wine, thyme and stir gently whilst on a low heat. 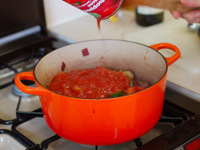 Mix in the tomatoes then add the bay leaves on top. Cover the pan and leave it to simmer on a low heat for 45 minutes stirring occasionally. 10 minutes before serving stir in the balamic vinegar. Serve with appoximately 60g/2oz pasta and topped with low fat parmesan or a similar cheese. I used spaghetti but any will kind of pasta will do.